Going green isn’t a new concept, but it continues to gain momentum in the beverage industry. Eco-conscious consumers seek out products that are both great tasting and also good for the environment. As a result, both on- and off-premise operators need to understand the various differences among sustainable products, and also be able to market those products effectively to consumers. One challenge related to green beverage products is that the terms “green” and “sustainable” mean different things to different people. Also, a product can be sustainable in one way and not as green in another. For example, a wine may be produced using grapes from a vineyard that uses sustainable farming practices, but it could still have added preservatives or sulfites. Therefore, it is technically not organic. In order to be classified as organic, a product must meet certain standards set by the U.S. Department of Agriculture. For wine, a product may be labeled as being made from organically grown grapes, or the label may specify that the wine is made with organic grapes without any added sulfites. Pesticide use in wine can be even vaguer and more difficult to understand. For example, the use of copper as an additive is considered to be sustainable, because it’s an organic substance. “Biodynamic” is another term used to describe how wine is produced using farming methods which do not utilize chemical fertilizers or pesticides, and also takes lunar cycles into consideration. Other wines are dry-farmed, meaning that vine roots are forced to go deeper into the soil, thereby producing more-flavorful grapes. Then there’s the general “sustainable” term, which refers to a variety of practices that may include farming, packaging, locality and social responsibility initiatives. Reputable wineries will include detailed information about a product’s ecological footprint on the label, better clarifying the different levels of sustainability. As far as other beverage categories — such as beer and spirits — green products aren’t as easily available. Or at least not yet. Many craft breweries and distilleries source local and organic ingredients for their products, which are generally touted on the label. Consumers can also select more environmentally friendly products based on packaging by buying beverages that come in more easily recyclable materials. With so many variations of green products from which to choose, it can be difficult for operators to promote these specific qualities to their customers. Educating staff on the different types of sustainable products available is a must, but it’s also important to grab a customer’s attention in case employees fails to strike up a conversation with an employee. In order to highlight your environmentally conscious products, effective displays are essential. Not only should the products be showcased in an eye-catching way, but their green characteristics also need to be easy for customers to recognize and understand. At Bay Ridge Wine and Spirits in Annapolis, Maryland, each product is highly scrutinized and evaluated for its farming methods before making it onto store shelves. Currently, 40% of the retailer’s wines are considered sustainable. In order to highlight your environmentally conscious products, effective displays are essential. “Our commitment to sustainable products is one of the things people really like about our store,” she adds. Harper takes special care to educate consumers on the differences among various wines. 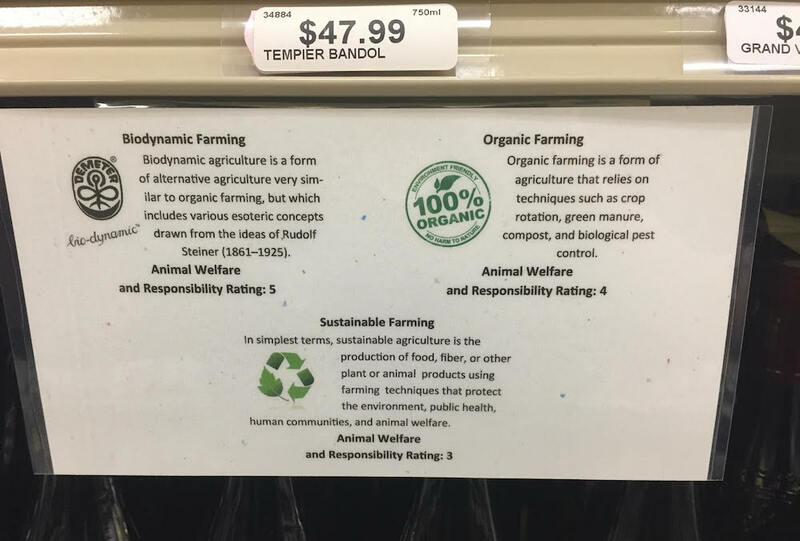 She cultivates a detailed guide for each wine for sale in the shop, which explains what “sustainable” actually means for each product. Small keys are displayed on shelves throughout the store, alerting customers to the different sustainable varietals of wine available. 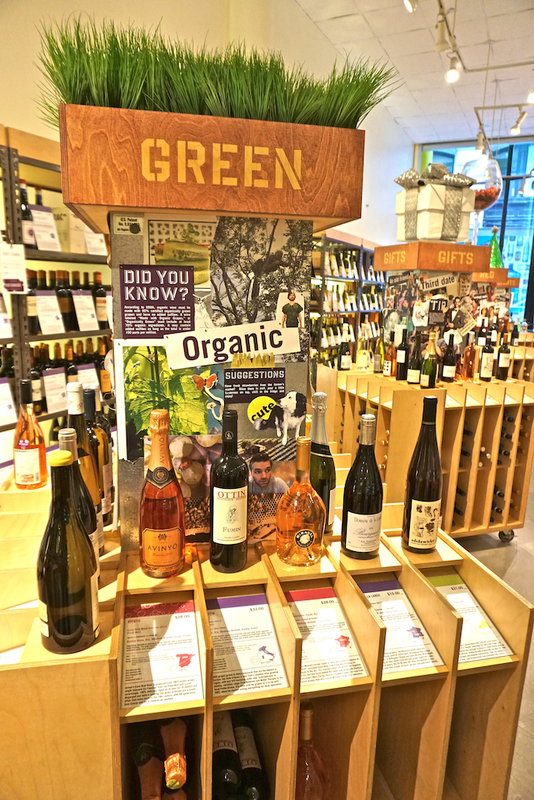 The keys provide useful information for customers coming into the store seeking organic or biodynamic wines, making it easier for people to see everything Bay Ridge has to offer in the area of sustainability. For customers who are not as informed about these products, the keys act as a natural conversation-starter for staff, and ultimately help the store sell more wine. Bottlerocket’s Wine & Spirit in New York City has a unique way of displaying products thematically. In addition to showcasing wine on a long wall in a more traditional way that’s organized by region, various island displays are located all around the store that allow customers to search for wine thematically — such as by green products. The design is so innovative that Bottlerocket had it patented. The company’s website is organized in a similar fashion. In addition to listing a product’s name and price, Bottlerocket displays include other details that Geniesse likens to “the bartender’s information” (what foods the wine best pairs with, etc.) and “the sophisticated consumer’s information” (tasting notes, etc.). Jimmy Hamilton is the General Manager and Sommelier at Legacy Wine and Spirits, located in Little Rock, Arkansas. He’s currently working to develop a new store display that will easily allow customers to browse all of Legacy’s sustainable wines. Hamilton believes that customers seek sustainable products for a variety of reasons, and he hopes that the new display will make it easier for green-minded consumers to identify the types of products they’re interested in. “A lot of times customers will come in having done more research on the products than the sales associates have, but you still need to do as much as you can to make it a smooth decision-making process for them,” he says. Hamilton touts health benefits as one of the main reason his customers seek out sustainable products, in addition to their desire to go green. Pointing out the health benefits of organic products is another display method to consider in your store. Local products are another type of sustainable beverage category that can be a big selling point for wine and craft beer. Eve Geroulis is a senior lecturer at Loyola University Chicago’s Quinlan School of Business. She says that the key to sustainable alcohol consumption is using local alcohol products, and that operators need to understand the value of locale and articulate that information to consumers. Integrating a selection of local products into the display mix at your store, bar or restaurant will add a new twist to sustainable beverages and also encourage consumers to support their surrounding communities. At Bay Ridge Wine and Spirits in Annapolis, Maryland, each product is highly scrutinized and evaluated for its farming methods before making it onto store shelves. While retailers have many options for displaying product information and engaging with customers, it can be more difficult for bars and restaurants to showcase their green product offerings. Jennifer Colliau is Bar Director at The Perennial, a San Francisco restaurant and bar focused on the benefits of progressive farming. Educating customers about the bar’s unique offerings can be challenging. The Perennial focuses on minimizing energy use and waste. All domestic wines on the bar menu come from producers who Perennial management feels does their best to source from organic vineyards. All European wines come from producers that are at minimum certified as organic, and many of them are farmed biodynamically. The bar at The Perennial lacks an ice cube machine and utilizes several innovative cocktail mixing methods, including one known as empirical dilution. The process involves using thermometers to craft stirred drinks, thereby regulating temperature and ensuring greater consistency. Colliau says she can measure the amount of dilution she’s getting by stirring with a thermometer, which ultimately gives her more control over the process and results in a better drink, she believes. Additionally, because the process eliminates the use of ice, the typical “shake, strain and dump” process of cocktail mixing is eliminated, resulting in zero waste. For shaken drinks, Colliau and her team use a blender to mix in exact amounts of ice, once again eliminating any wasted resources. Although the bar currently doesn’t explain its unique cocktail preparation process on its menus, staff are always available and eager to discuss these innovative methods. Many of The Perennial’s cocktails are also sustainable in that they eliminate the use of waste. Such as the Grapefruit Marmalade, which incorporates into the drink both the juice and the peel of the fruit. These details are included in the menu to alert customers of their sustainable option.